The wooden bridge known as Kapellbrücke (lit. 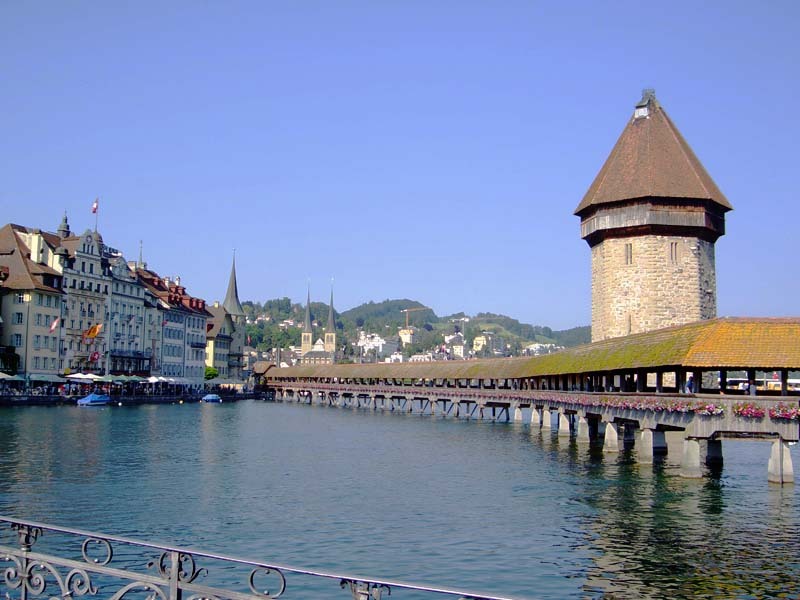 chapel bridge) can already be seen in a 1597 engraving, and is the first thing that catches your eyes when you make a tour of Lucerne. 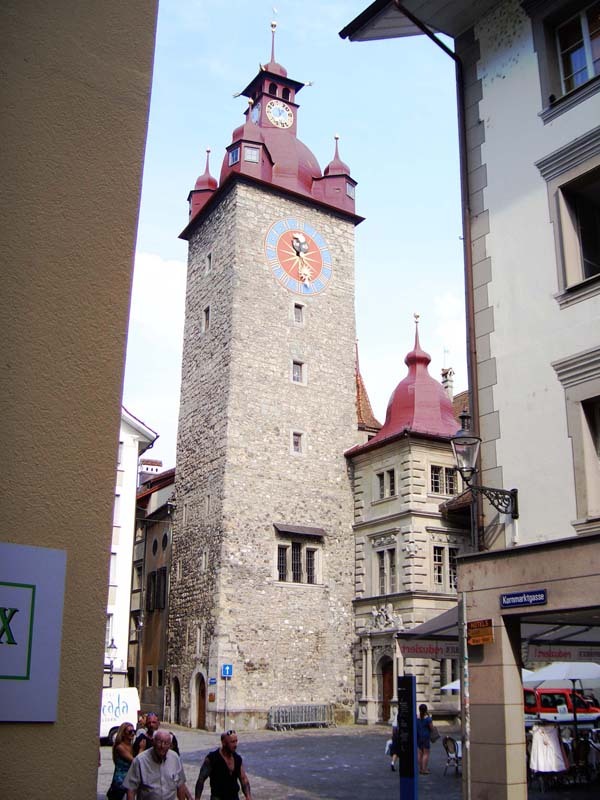 But I was particularly impressed by the water tower (Wasserturm) for its original location (in the midst of plenty of water), demonstrating how down-to-earth practical these Swiss are, indeed. town north bank, seen from the Rathaus-Steg. 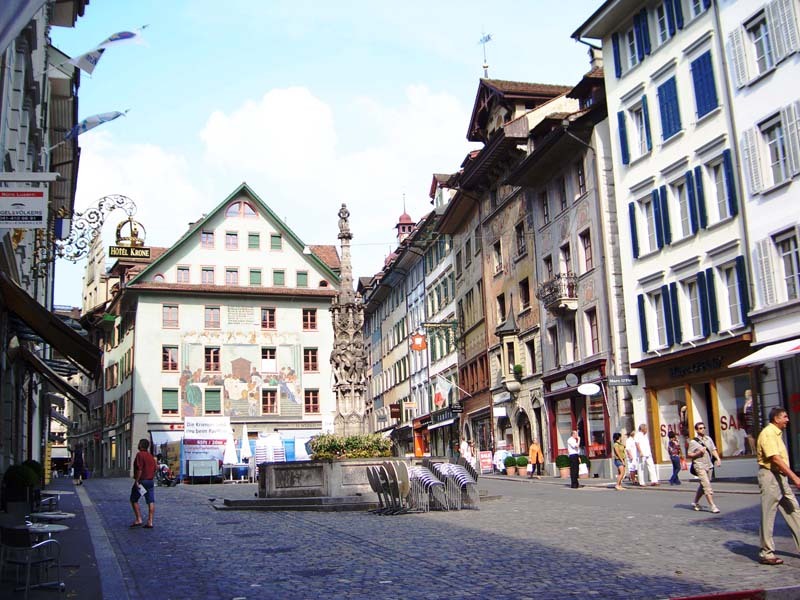 Above: the Weinmarkt (wine market) square seen from the East (mid) and from the West (right), formerly the site of the traditional annual Passionsspiele (Passion or Easter play[s]). These were elaborate two-day dramatic presentations with several acts performed on specially built wooden stages, as I learned from the conference presentation of H.-G. Kaufmann. Left: a glimpse on to the clock tower of the Rathaus (city hall) across the Kornmarkt square, from the exit of the Kornmarktgasse (corn market alley). 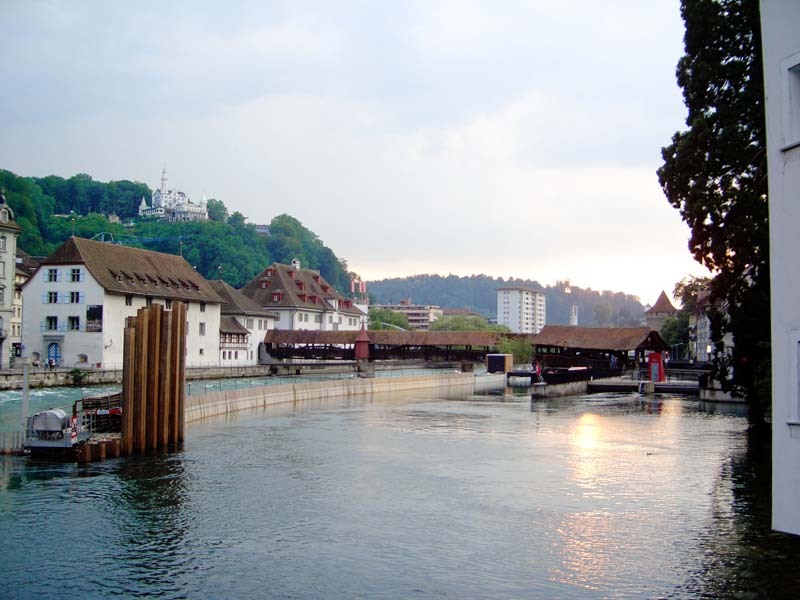 The covered Speuerbrücke (wheat bridge) crossing over the artificial rapids (left of the mid river partition) and parallel sluice (on the right). That apparition of a white fairy-tale castle on the left hill top is the Chateau Gütsch  its real. No, I did not accidentally insert a picture from Venice. 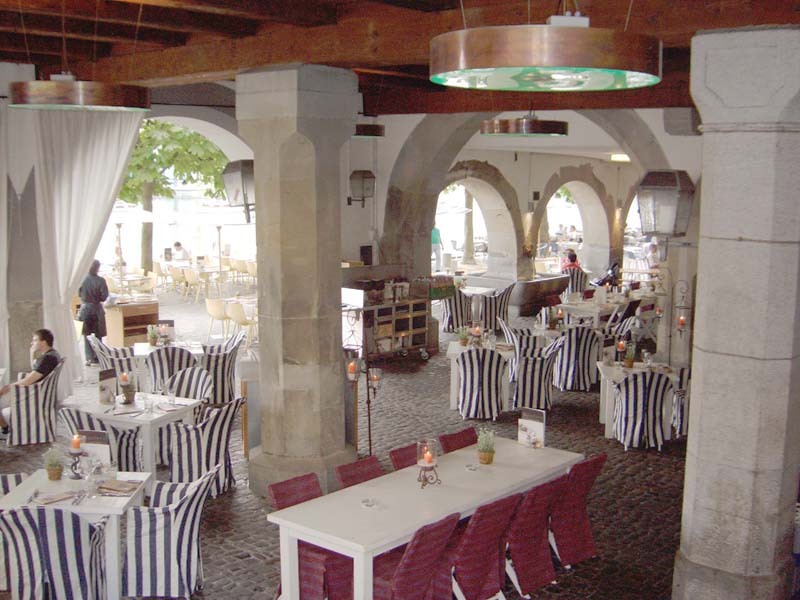 This arcade restaurant looking out on the riverside promenade is the Restaurant Rathaus. It is, however, not in the city hall, but next door to the west of it. 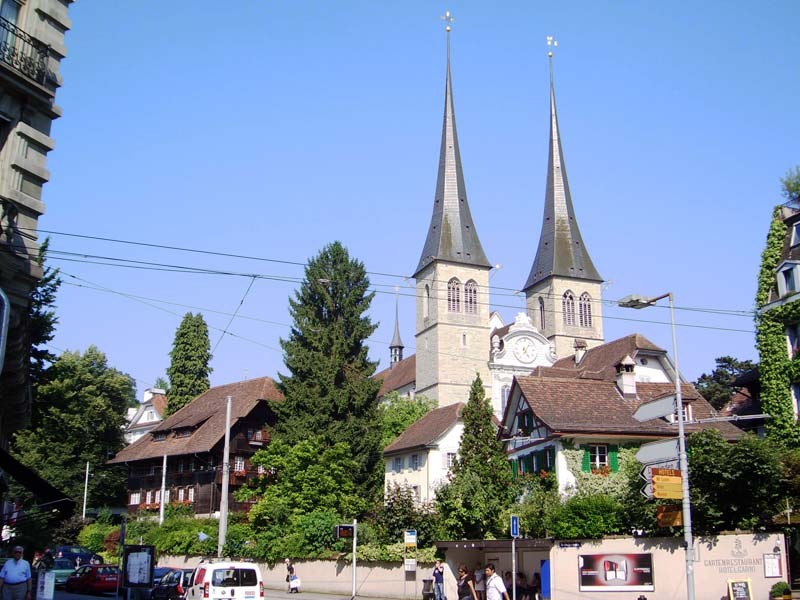 View from the crossing of Löwenstraße (left-right) and Dreilindenstraße (forwards) to the Hofkirche (collegiate church). I was simply charmed by the traditional architecture of these in-town houses. (The conference site was two blocks to the left). 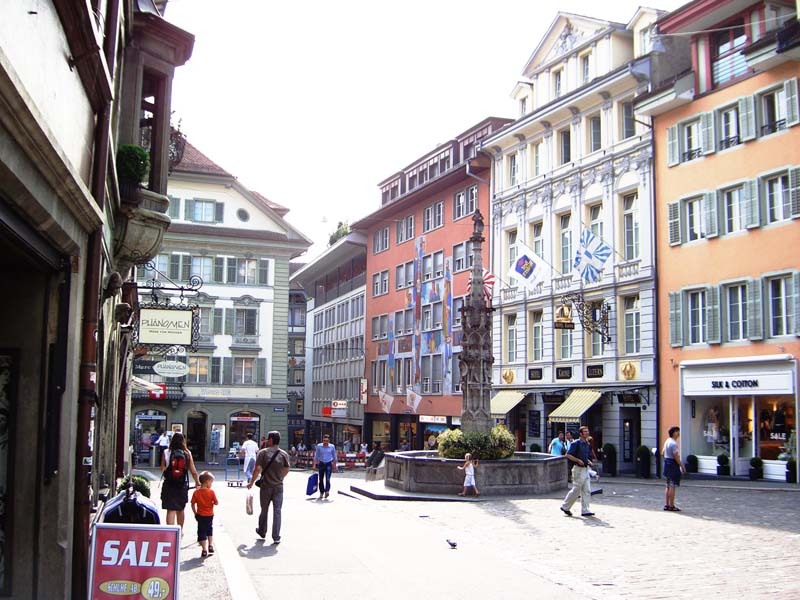 But globalization has also reached Lucerne, as this sidewalk right across from the railway station demonstrates. Everything was within pleasant walking distance, so we never used the trolleybus or taxi. 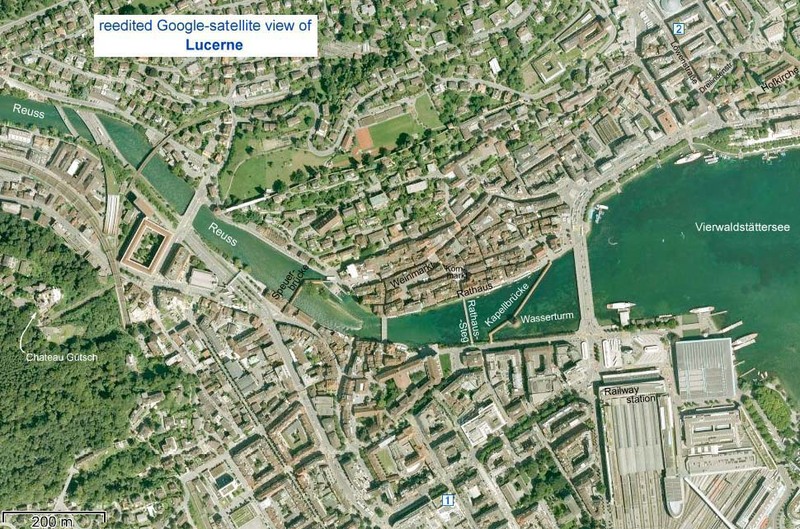 Locations of the photographs are indicated on the satellite-view map of Lucerne above. The globalized sidewalk is west (left) of the railway-station. We stayed at Hotel Astoria at the mid bottom of the map ( ); the conference was in the Union Lecture Halls on the Löwenstraße at the top right of the map ( ).